An original building on the property, R.J. and Margaret Haney’s home was built around 1910. The house is a strange mix between practicality and gentility with the main construction resembling a practical farmhouse embellished with leaded glass windows and fancy woodwork. Scheduled guided tours of the house are included with your general admission. A virtual twin to the Methodist church at Hedgman's Corner, the first services took place in 1911 and the church was in continuous use by different denominations until the 1970s. It was moved to the village in 1988 and is still used for small weddings. Wm. Newnes saw an opportunity when he learned that Miller's blacksmith shop was for sale in Salmon Arm. He knew that this shop was an essential part of community life. Master blacksmiths were needed to make and repair farming equipment and shoe horses. Construction of this scale replica was made possible by donations from the Newnes family. Alf Westerberg built this service station for A.D. Meek in 1927. In 1935 the log structure was dismantled, removed, and reused as a cabin at Paradise Point on Shuswap Lake for many years. Thanks to the Shuswap Chapter of the Vintage Car Club of Canada, it has been fully restored. This building is a replica of Salmon Arm's first firehall that served the community from 1913 to 1936. Two hose reels, specialized fire fighting buckets, and the first fire truck are on display. This replica was built by members of the Volunteer Fire Department. The one room Broadview School was constructed over the winter of 1917, and officially opened in January 1918, and saved neighbouring children a long walk to Canoe or Salmon Arm. The school was moved to the village in 1988 and now houses Marjorie’s Tea Room in the school’s gymnasium. School re-enactments occur regularly as part of the daily activities from May - September included with your general admission. The Chinese Cook's house is from the Kinghorn Estate in Sorrento. This log building came to R.J. Haney Heritage Village completely disassembled in 1986. The log home has now been incorporated into the amphitheatre, the main venue for SASCU Presents Haney Dinner Theatre, in addition to other Haney Heritage Village productions. One of the first log homes built in the valley, this building is a good example of the Finnish style of log construction. Moved to the park from the Kew homestead at Minion field on 30th St. SW, the site also includes the Peterson Barn which is an outbuilding of similar construction. Watch for future developments - including a kitchen garden and small orchard. Meet Miss Emily McGuire, Postmistress, at Salmon Arm's longest serving general mercantile. She will also sell you a candy stick! Emily's brother, S.M. (Sam) McGuire, took over operations after their brother Charles passed away. Abandoning the trading post location, Sam had a new building constructed in 1902. It sat on the corner of Alexander Ave. and Front Street in the heart of downtown Salmon Arm. 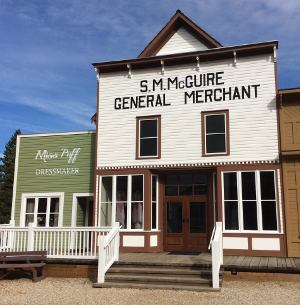 The McGuire General Merchant is also home to the administration office, reception, the Montebello Galley, archives and artefact collection and gift shop. Public washrooms are located in this building. This building contains the Cobweb Corners exhibit inspired by private collector, and radio show producer, Sam Beemish. The display contains a recreation of Sam’s recording studio, complete with his 6,436 records, 909 cylinders, and several antique record players. 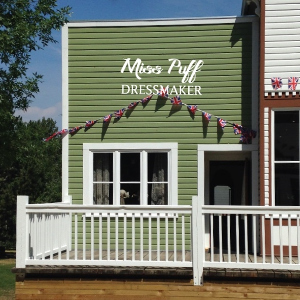 Late of Winnipeg, Bohemian born Miss Bertha Puff set up shop in Salmon Arm in 1907, bringing advanced fashion ideas to a sleepy farming community. Take a peek into the change room to see Miss Puff's handiwork! This exhibit is a partnership with the Shuswap Quilters’ Guild. A lookout station from Queest Mountain on Anstey Arm tells the story of forestry protection in the Shuswap. The tower was helicoptered off the mountain, relocated, and refurbished by the Salmon Arm Forest District staff in 2005. 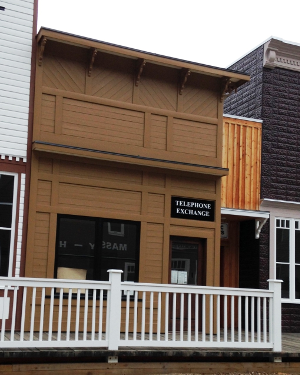 This scale-model replica of the Lester and Thomson Car Sales building was completed in 2007 thanks to financial support and sweat equity of the Shuswap Chapter of the Vintage Car Club of Canada. The exhibit was installed in 2013. The original building was situated on the corner of Alexander Ave. and Front Street (Lakeshore Drive) in downtown Salmon Arm. Moved in 2008 from Fraser Avenue in Salmon Arm, this is the first house moved onto the village site. Built about1923, very few modifications have been made to the layout of the house. Since arriving at Haney, the Pidhirney Home has been re-roofed and its cove siding painted with period-appropriate colours, but funding is still needed to restore the interior. The most recent residence added to the village, this log home was moved from North Broadview Rd. in 2010. Built from logs from the property ~ 1922, it was home to newlyweds Albert Laitinen and Vera Halpenny. Miss Halpenny was the first school teacher at the Broadview School. Restoration work on this exhibit is ongoing. While the R.J. Haney Heritage Village showcases local history, the buildings only take up a few acres of the forty acre park. Guests are free to explore the 2.34 km of walking trails that wind through grassy meadows, sheltered wooded slopes, and cool wetlands. The museum building is temporarily closed during renovations and will open in the near future as the Village Restaurant, Spring of Heather. Visitors to the Village will be able to enjoy a home-style lunch and special baked goodies. The Spring of Heather will offer catering services for weddings and other catered functions at the Village. It will also provide dinner service for our popular Villains and Vittles Dinner Theatre during July and August. The Telephone Exchange will open July 8th. Meet Mrs. Brian Harper at the switchboard or her sister-in-law Mrs. A.E. Cummings. Who else will be listening in on the party line? The original Telephone Exchange served a total of 29 customers. Residents called 23 to place an order at McGuire General Merchants or long distance as far as Vernon, British Columbia!